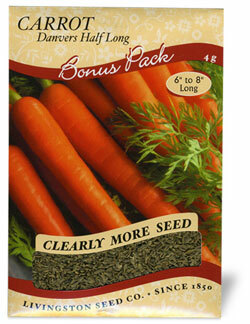 Its tenderness and sweet, rich flavor make the Danvers Half Long Carrot a tasty garden treat. Traits of Danvers include its blunt-ended 6-8"L roots, smooth texture, deep orange color and fine-grained flesh. Ideal for canning and freezing. Garden Tip: Give carrots a full sun location and they will give you a bountiful crop.